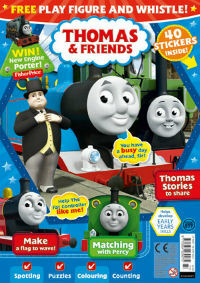 Thomas the Train is a guide for Thomas the Train & Friends, your one stop source for information on Thomas the Train. This fan based website is run under the direction of these amazing preschool brothers, Charles and Adam who are 4 and 2 years old. Download Free Thomas Coloring Pages. 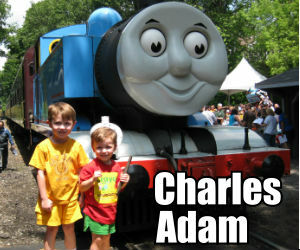 Please join Charles and Adam on their wonderful learning adventure with Thomas the Train and Friends from the Island of Sodor. The boys will focus on all the wonderful Thomas & Friends characters including their names, pictures and useful purposes. This information is very helpful for parents and family members identifying gifts for children especially for their birthdays and during the holidays. You will soon learn there are many train engines and frieght cars to collect from the Island of Sodor! Charles and Adam will instruct us on all the wooden and plastic trains available to collect including the different Thomas Train track layouts, bridges, buildings and structures. Learn all about the wonderful Thomas the Train books and videos, Thomas the Train book bags and Thomas the train backpacks. Free Thomas the Train Table plans are available too! Join Charles and Adam with neat Thomas and Birthday party ideas for cakes and activities for the children to celebrate with. Other fun learning opportunities include Thomas the Train coloring pages, how to create a Thomas the Train cake, and how to build a Thomas Train table too! You can also find the most update information and schedules for Thomas the train events and theatre. In particular here are the listings for a Day Out with Thomas 2018 and Thomas and Friends Live On Stage 2011. 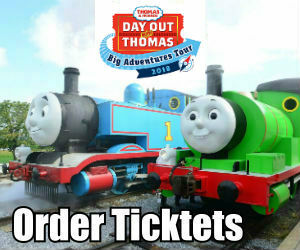 The Day Out with Thomas is one of the most popular Thomas activities to experience as a family. 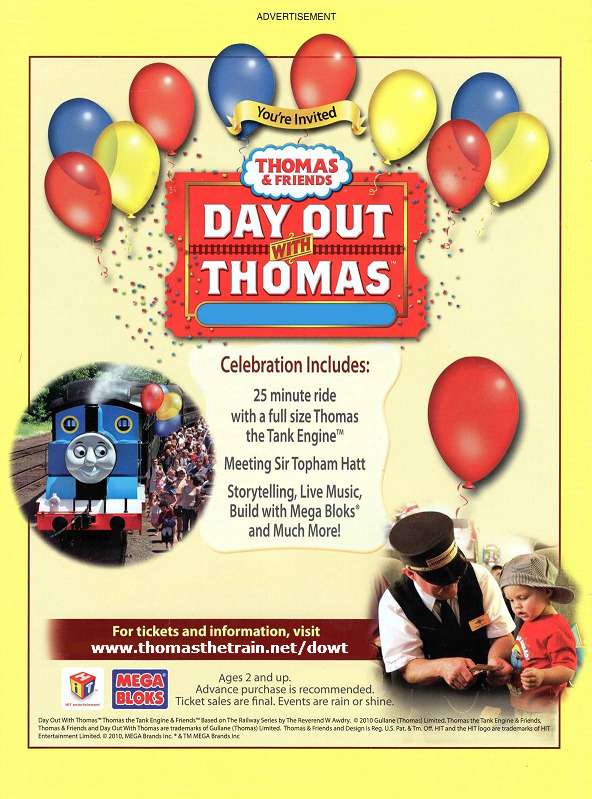 This event is a wonderful opportunity for kids and grown ups to experience the world of Thomas & Friends. Children love to ride on board a train led by Thomas! This is a fun filled event for children to enjoy. Charles and Adam loved seeing Thomas live on stage. They also enjoyed seeing Percy and Diesel too. This is wonderful opportunity to build memories for the children and to introduce them to live theatre. The storying telling and singing is just great. New Jersey has a number of excursion train rides to experience and a host of Narrow gauge railroads as well. We are trying to visit as many of them as we can and share our experiences and photographs with everyone. These trips are based family time and educational and fun things to do for young children. Thomas coloring pages provide countless hours of fun for children. Charles and Adam would like to share their favorite Thomas and Friends Free coloring pages with you. They would also like to recommend a few books on really good Thomas coloring pages with learning activities and Thomas stickers! Have fun coloring the three new characters featured in Day of the Diesels. Meet Fiery Flynn the fire truck, Brave Belle, and three new Diesels named Sidney, Paxton and Norman. For Diesel 10 fans we have a new and free thomas coloring page diesel 10 to download. There are six free Diesel 10 coloring pages to choose from! Here is a free coloring page of Emily the train. She is a member of the Steam Team and acts like the big sister in the group. For Gordon the Express Engine fans we now have a free downloads of Gordon coloring pages. Download load Hiro Coloring Page for free. Hiro is Master of the Railway and he is a very special engine. For James the red engine fans we now have a free download Jame coloring page. Are looking for the logging locos to color or how about Captain. Download and color Bash and Dash, Ferdinand and Captain from Misty Island Rescue. Ferdinand the logging loco is favorite coloring sheet, download and color all of them for free. Download free thomas coloring pages of Spencer the fast and sleek engine. Download these free coloring pages of Thomas, Lady and the Conductor from the Magic Railroad. Print and color these sheets to make your own Magic Railroad Coloring Book. So are you confused by all of the Thomas the train characters and how to attempt to collect them? Learn how to collect Thomas trains with free tips and information. This is a handy guide to help identify, locate and find all of the thomas trackmaster trains. Charles and Adam have created a list of trackmaster trains to help their Uncle's find the ones missing from their collection. This is a handy guide to help identify, locate and find all of the thomas TOMY trains. This list was created by Charles and Adam to help their Uncle's find the trains and trucks for their collection. This is a complete list of Take n Play Thomas. Use this handy guide to help identify, locate and find all of the Take n Play trains by Fisher-Price. As of 2010 the line of trains has been introduced and this list will be updated as trains and vehicles are added to help you find them. This is a complete list of Take Along Thomas. Use this handy guide to help identify, locate and find all of the Take Along trains by Learning Curve. 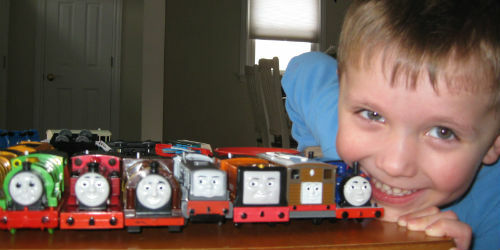 As of 2009 the line of trains has been discontinued which makes them harder to find and increases the value of these diecast trains and vehicles. Providing a collectors guide list for the Early Engineer wooden railway fans. This a small ranges of Thomas and Friends engines are chunkie by design to be easy to handle as an introduction to train fans. These are compatible with the main Thomas wooden railway series to allow growth and transition to the other broader wooden railway line. This is a handy guide to help identify, locate and find all of the ERTL thomas trains. Adam received his first ERTL Murdoch from Aunty Beth and decided its best to create a guide for collecting Thomas ERTL trains too. Handy collectors list of ERTL Gold Rail series Thomas trains. Helping you find and indentify these magnetic diecast engines, cars and playsets. This was a limited series of only 14 engines and 4 playsets from circa 1993-1994. These Gold Rail engines and cars were highly detailed die-cast metal with magnetic couplings. They are relatively inexpensive and fun to collect, a nice starter set to work with. Charles and Adam unbox Cranky in the Got Cranky? Video. Its lots of fun, so make sure you watch the boys put Cranky together and assemble the set which includes Flynn and a blue coal car. Download and print a Free Cranky Color Page too! Thomas and Friends Wooden Railway Island of Sodor Wooden Play Tables are wonderful to own but their even better when you can build one on your own. Learn how to build a Thomas Train Table from simple materials available from most local home improvement centers. This is a great project to work on with dad. Join Charles and Adam as they show other kids how they can replace and repair their TrackMaster Thomas Engines and Cars. These Thomas the Train Hook & Eye Couplings break easily and are hard to find. The boys have figured out a way to repair their trains! Are you searching for retired Thomas Trains? Each week you will be surprised to find rare and hard to find Thomas the Tank Engines and all other Thomas and Friends collectibles especially rare Thomas wooden trains. These beds are the most recognized and admired by toddlers. They have special nook to hold books and trains. There are also tracks that are molded into the bed rails to allow for children to play with their toy trains and cars on them. Information on recalled Thomas wooden vehicles, buildings and other train set components originally recalled in 2007. Providing a handy Thomas Recall List and Thomas Recall Photos to aid parents when considering used toys from garage sales, flea markets, swap meets, classifieds and online. Here is an interesting toy, a combination of a transformer with Thomas and Friends. These robot trains are unique and colorful. Give the perfect Thomas train gift with one of these several super robot transformable trains. This is probably the best battery operated Thomas train you can collect. The Water Tower Steam Set is discountinued but you still can find them here. Thomas is metallic blue and inlcudes Annie & Clarabel but the best part is he makes real steam when he chuffs, his funnel glows red and he toots his whistle as he chuggs along pulling his coaches. The fact it makes steam reminds children how magical Thomas and Friends really is.